Explore the walkable historic centre of Girona and trace its more than 2000 years of history. Discover the Jewish quarter, a maze of narrow cobbled streets, stairs, patios and archways and also one of the best preserved in the world. Girona it’s a jewellery box of museums, galleries and Gothic churches, strung around a web of cobbled lanes and medieval walls. Reflections of Modernista mansions shimmer in the Riu Onyar, which separates the walkable historic centre on its eastern bank from the gleaming commercial centre on the west. 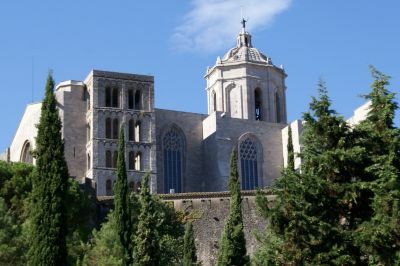 The historic city of Girona invites visitors to trace its more than 2000 years of history through two fortified enclosures, the Força Vella and the Medieval Quarter. The Força Vella dates back to the Roman foundation while the medieval extension of the city walls was carried out during the 14th and 15th centuries. The city's artistic heritage has been preserved in the numerous monuments that have survived until today. The highlights of Girona are rounded off by the impressive Jewish Old Quarter or Call, with its beautiful streets and porticoed squares, and by the exuberant baroque spaces and Noucentisme-style buildings by architect Rafael Masó. With Catalonia’s most diverse nightlife and dining scene outside Barcelona, Girona is a fantastic distraction from the coast. Upon arrival meet your Private English-Speaking Local Guide at the tourist office, which is beside the river and bus parking lot. Direction will be given.